We have many of the obsolete Panelview in stock! Including the Panelview 300, Panelview 550, Panelview 600, Panelview 900, Panelview 1000, and Panelview 1400 are all standard operator terminals that have been designed in a variety of configurations and sizes to fit a specific need or application. Our most popular models include the 2711-M3A18L1 and 2711-M3A19L1. The Allen Bradley Panelview Plus 6 Displays are Operator Interface Panels that range in size from 4 inch to 15 inch Displays. Popular Panelview Plus Touchscreen models include the 2711P-T10C4D8 and the 2711P-T6C20D8. Keypad Models include the 2711P-K4M20D8. The Allen Bradley Flex I/O series include parts that start with the prefix 1794. This series consists of distributed i/O system that allows the user to communicate with many different network types. The communication modules can control up to 8 input/output modules. The 1794-ASB Remote I/O communication module is part of this series and is in stock. The Allen Bradley MicroLogix 1000 start with the part number 1761. These programmable controllers are built with a processor, inputs/outputs, and a power supply. They are available in 10, 16, and 32 Input/Output DC models as well as analog models. Popular part numbers include the 1761-NET-ENI, 1761-l32BWA, and the 1761-L32AWA. The Allen Bradley CompactLogix start with the part number 1769. This series features a rackless design which allows the modules to be din rail mounted. This series has a variety of processor, analog, thermocouple, RTD, and digitial I/O modules. Popular modules in this series include the 1769-IF8 or the 1769-L35E. The Component Panelviews start with the part number 2711C, they are panel-mounted HMIs that are either Color or Monochrome. They come with built in software and communication ports. They include the 6 inch Color 2711C-T6C and the 10 inch Color 2711-T10C. Some of the PanelView Plus Terminals are obsolete, however we still have many of them in stock- Including the 400 to 1500 terminals (series 400, 600, 700, 1000, 1250, 1500) which use modular components with value-added options for flexible system configuration; display module, logic module, and optional communication module. The Ge Quickpanel view is an touchscreen interface module. The QuickPanel is available in different configurations to suit your requirements, either as a full feature HMI, or a combination of HMI and controller for local and distributed control applications. Parts starting with IC754 including IC754VSI06STD and IC754VGI06STD. 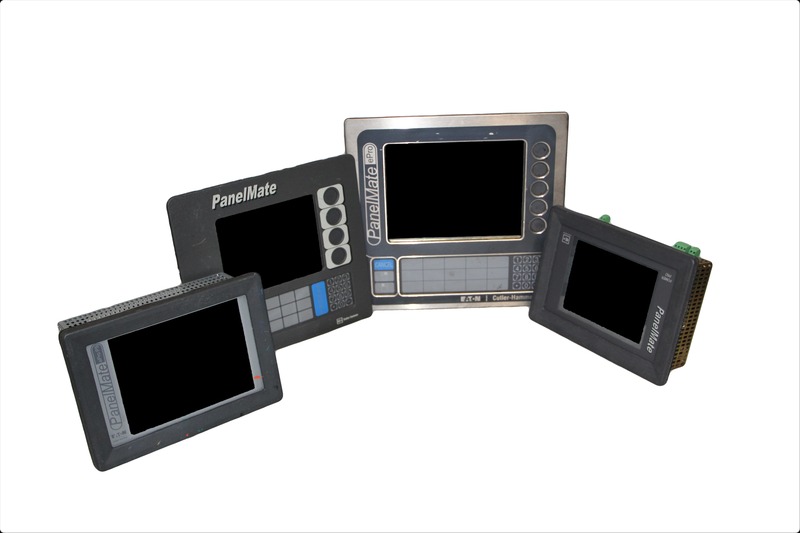 The Eaton Cutler-Hammer Panelmate User interface Panels operate with touchscreens or keypads and allow users to control their machines. These HMI displays are industrial grade and can be installed in harsh environments. Popular models include the 7685T-8 and 7685T-10C. The Eaton Drives include the SVX 9000 and the HVX 9000 drives. These drives were designed for many different applications from HVAC to fluid control. They are suitable for multiple motor drive systems and many other systems.